Terrance Woodbury was the high scorer of the team on both days tallying 30 points on Saturday and 28 more on Sunday. With the season’s Western Conference championship already in the bag, the Ryukyu Golden Kings played relaxed in front of the home fans at Okinawa City, trashing the Gunma Crane Thunders twice over the weekend, using the games as a warm up for the coming playoffs. Anthony McHenry scored 24 points Saturday, and another 18 Sunday. 11 points along with 12 rebounds. 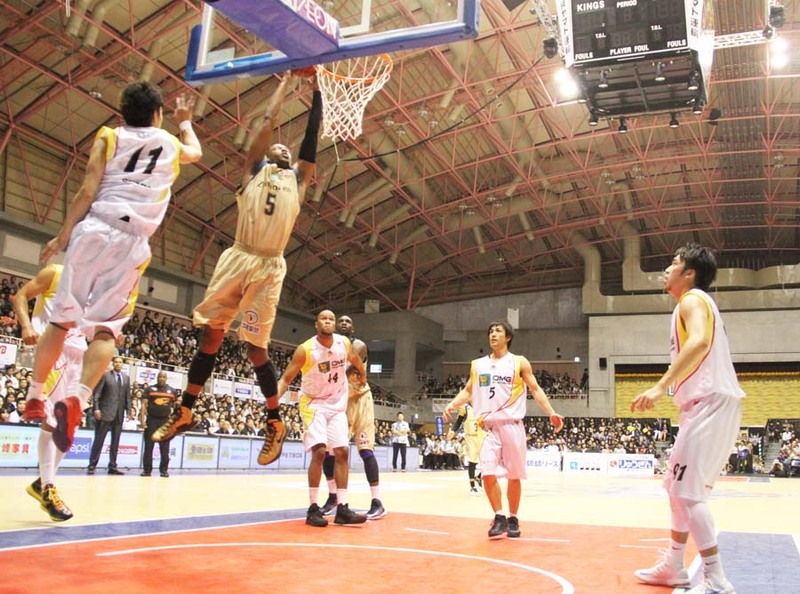 Sunday was a repeat of Saturday, with the Golden Kings rolling to a 98-72 victory over the 12-36 Gunma squad, boosting the season record to 38-10, with a home court scorecard of 24-3. Terrance Woodbury again was the game’s high scorer, with 28 points, 11 rebounds and three steals, while Anthony McHenry was next with 18 points, 12 rebounds, four assists and three steals. Dzaflo Larkai picked up 17 points and Naoto Kosuge brought in 13. The fans were out in force to see the reigning league champions in action, with 3,530 in the arena Saturday and 3,701 on Sunday. They witnessed coordinated defensive play that held Gunma’s point-getter, Jarmaine Dixon, to only 11 points Saturday and 10 on Sunday, compared with his usual 16. The Saitama Broncos, the league’s third worst team, found themselves losing to the Tokyo Cinq Reves 101-83 in their first encounter, but rallied Sunday to pull off a 122-100 win of their own. Tokyo’s now 17-31 and Saitama 14-34. 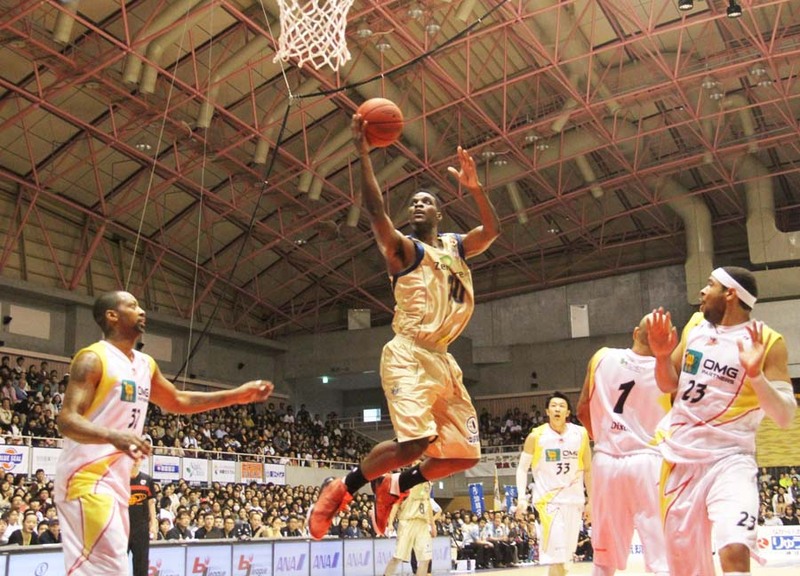 The Chiba Jets made their way into the playoffs with a split series against the Sendai 89ers. They lost the first, 92-89, but bounced back to capture a 99-92 win in overtime. The Jets are now 24-24, while Sendai’s 19-28 and out of the playoffs picture. The Toyama Grouses, tied for first place in the Eastern Conference, pulled off an 89-83 victory over the hot-shooting Yokohama B-Corsairs in the first game of their series. They couldn’t hang on Sunday, though, losing to Yokohama 96-72. The B-Corsairs are the ones tied with Toyama for first place in the conference. Yokohama’s now 32-16 and Toyama is 32-16 as well. They’re tied with the Niigata Albirex BB. All three teams have four regular season games remaining. The Albirex BB outlasted the Akita Northern Happinets 79-70 on Saturday, only to lose 65-62 on Sunday. The 24-24 Happinets still are in the playoffs hunt, while the Albirex BB are32-16. The Iwate Big Bulls picked up a win over the Shinshu Brave Warriors, 92-82, in the first game of their series, then did it gain und, 95-83. Iwate’s in playoffs contention with a 31-17 record, while Shinshu’s out with a 16-32 season record. The Osaka Evessa continue their winning ways with a pair of victories over the Oita HeatDevils, 88-77 and 107-94, to improve to 22-26. The season started with Osaka I deep slump, having only 5-19 record before Bill Cartright took over as coach. The Fukuoka Rizing outdid the Hamamatsu Higashimikawa Phoenix 69-58 and 60-51 to move their record to 33-17, good enough for a shot at the playoffs. The Phoenix still has a chance with a 26-22 record. The Kyoto Hannaryz trounced the Takamatsu Five Arrows 79-51 in their first encounter, and won again, 74-71, in the second stanza to run their record to 27-21 and a chance at the playoffs. 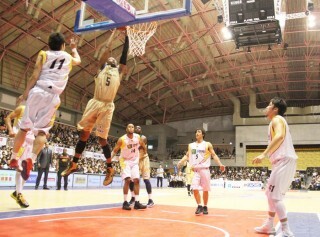 The Shiga Lakestars likewise swept their series, outdistancing the Miyazaki Shining Suns 78-75 and 77-68. The Lakestars are in line for a playoff berth with a 30-18 record, while Miyazaki’s in the cellar at 9-41.